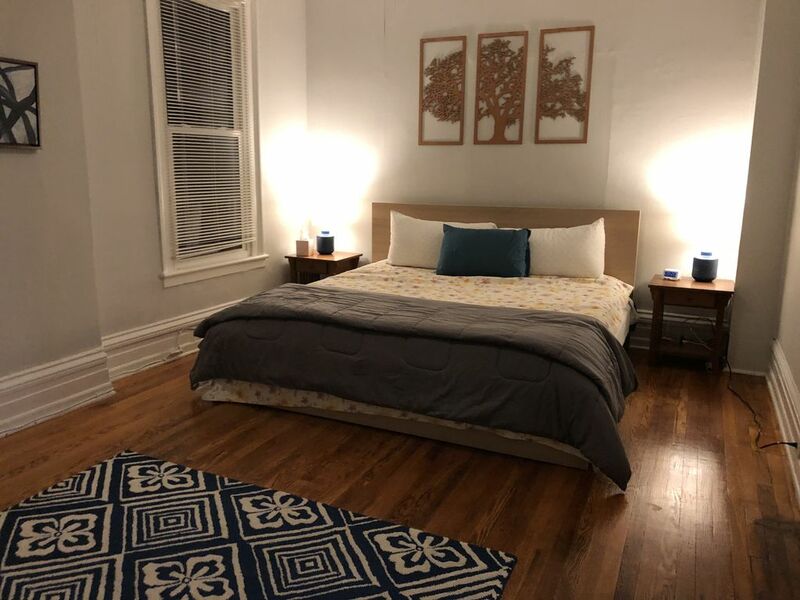 This spacious two-bedroom has bright light, a well-stocked eat-in kitchen, enormous master bedroom w/ king bed, office nook, and second bedroom with a wall of southern windows. This is all located on a quiet block near the Hudson River and many restaurants. Walk to RPI, Russell Sage, downtown businesses, and entertainment. You ll find several closets, washer/dryer, large screen SmartTV, work-friendly desk, & comfortable office chair. We offer stays over 30 nights, families and dogs welcome. Walking distance to restaurants, entertainment, and Troy businesses and services. Historical features of Troy. window units for bedrooms, ceiling fan in master bedroom, two additional fans for cooling and air circulation. can provide high chair upon request. Additional chairs and larger dining table also available on request at time of reservation. also have city-friendly stroller for guest use, baby bath, and toys upon request.